I chose the angel face and the unicorn. (Which by the way took forever to come off.) I chose the angel face because I feel like it represents FLA and my life. I am happy and content with where I am and what I am doing. I’m glad I made the decision to join FLA. I chose the unicorn to represent our time at Conner Prairie the night before. It was a “magical” experience that is one of those events that was so interesting, it will always stay with you (kind of like my temporary tattoo). It was a great weekend! 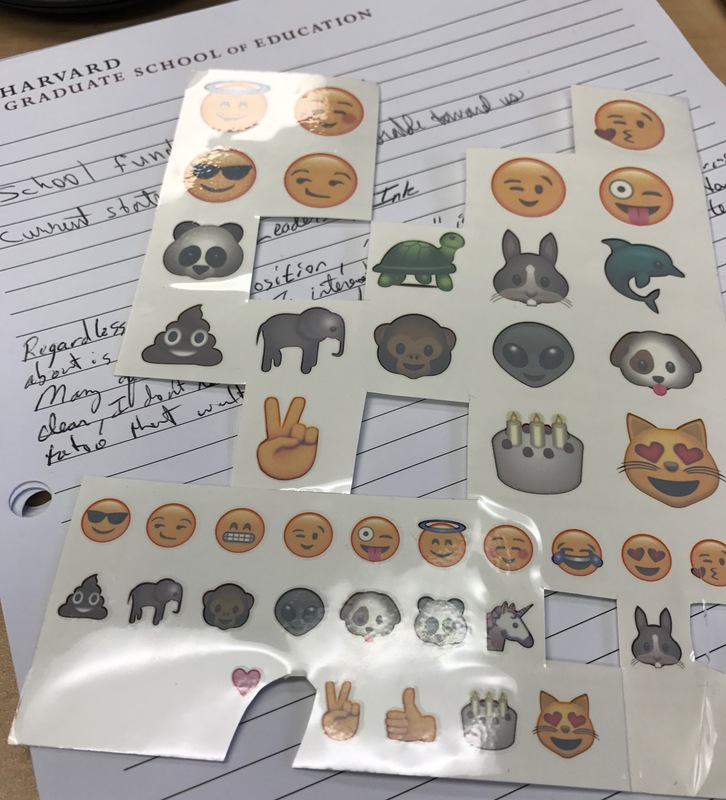 I picked a “Cool Emoji” and a “Blushing Emoji” and placed them on each hand. This is because I have felt pretty cool about evolving into an autonomous leader with a voice who can actively make a difference at my school. 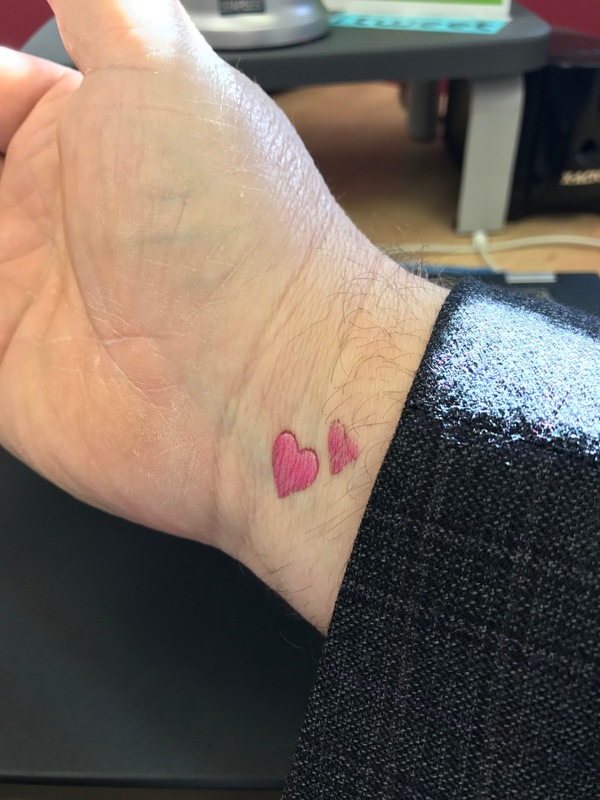 I also picked the blushing emoji to represent the humbling experience I’ve had through blogging, as I have recognized my weaknesses and set action plans to correct them through a book study and weekly reflections. The emojis were placed on my hands, because that is where I type and use my mouse to create, plan, and implement these things. I chose 3 emojis to express my feelings about FLA. The crazy face, hearts, and the alien. The crazy face was to represent how FLA pushes me out of my comfort zone at times. The hearts were for the relationships I am building with my fellow teachers and for the LOVE I have for Hoosier. I really look forward to our Saturday retreats and feel refreshed afterward. The alien was to express that sometimes I feel out of place. I am surrounded by so many talented and intelligent teachers in our cohort. I am learning so much from everyone that sometimes I wonder if I am contributing to our group enough. But, then I made the board later in the day and felt validated…HA! The smiley face with heart shaped red eyes placed right above my heart is how I chose to “emoji” my experience thus far in our Focused Leader Academy. The evening before our retreat Dr. Ernest planned a memorable and meaningful evening at Conner Prairie for the FLA members and our families . We enjoyed a dinner and those of us with children got to experience the magic of our little loved ones having an intimate moment with Santa Clause (insert smiley face with heart shaped red eyes). I call it intimate because he was so genuine. He took time with each child to truly listen to them and make them feel like they were about to sit up on Grandpa’s lamp for a story (insert smiley face with heart shaped red eyes). I made my 16 year old son and 13 year old daughter join my 3 year old and what happened in that moment was magical. They were all just little kids again experiencing the magic of Christmas (insert smiley face with heart shaped red eyes). The only way that emoji could illustrate my feelings at that moment any more is if there were little twinkles in the hearts. I also got to see my friends and colleagues with their loved ones (insert smiley face with heart shaped red eyes). Given the relationships we have built since beginning our cohort began, I don’t think this could have possibly happened at a better time. Watching everyone with their families and our some of our families interacting with each other just made me (insert smiley face with heart shaped red eyes)! We continued the evening with a guided luminary walk of the 1842 Conner Prairie village where, as a FLA family, we got to visit various houses in the village each one sharing with us a piece of their story as it relates to the holidays and their varying beliefs and traditions. How truly blessed we all are (insert smiley face with heart shaped red eyes). I came to the retreat Saturday morning a little emotional to say the least. I’m that woman that cries at all the commercials. Not a bad emotional, that happy, cry at the happy ending of a great movie kind of emotional. When I walked in to our meeting, I felt a bit of a difference in the aura. We were close before that evening, but I felt a different type of close. I felt warmth (insert smiley face with heart shaped red eyes). I felt that we all had a deeper understanding of each other (insert smiley face with heart shaped red eyes). I felt that we were a bit more open and honest in our conversations (insert smiley face with heart shaped red eyes). It was no longer just a group of colleagues and friends but it felt like our own little community and family (insert 2 smiley faces with heart shaped red eyes!). While explaining my emoji to the group, I shared how much I love the conversations we are having, the professional growth we are experiencing together and of course, the opportunity to see them and their loved ones in the magical evening the night prior (insert smiley face with heart shaped red eyes). The emoji theme carried throughout the day and one thing is certain, I (insert smiley face with heart shaped red eyes) my FLA family and the privilege to learn from each and every one of them. Maybe my comment box should have had a character limit! (insert blushing emoji). Did I just comment or did I just blog!?! I chose the smiley with heart eyes and the, what I can only describe as, yikes emoji. I chose the heart eyes because I just love being in the Focused Leadership Academy. It is so refreshing and inspiring to collaborate with you and other like-minded colleagues on a regular basis. I truly feel blessed to be a part of it. And I truly love spending an entire SATURDAY once a month with these people…that says a lot right there! I chose the “yikes” emoji because I find it a challenge to carry that positive attitude and feeling of refreshment back to my daily grind. It is so easy to just fall back into old mindsets…it has been a semester full of professional and personal growth for me. I’m still working on leading from where I am and not letting negativity seep in. Oh, and let’s not forget my kid got sick in the buffet line at Connor Prairie…definitely a “yikes” moment! I placed my tattoos on the top of my forearm. I chose that area because it is typically showing and creates a constant reminder for me to keep my mindset and goals in check. And they are literally not washing off so I’m pretty sure it’s going to be a CONSTANT reminder!